The Seven Key Principles in understanding the Governing of each Biblical Dispensation of Scripture. Four of the principles would not come into operation if failure not occur, but because of failure, the last three functions bring about the change, and a new dispensation with a new stewardship Institution. However, if the last four do not occur, then the dispensation would be eternal, and the only one, which will meet that level of victory will be the Dispensation of the fullness of time, the Kingdom of God. Universal Rules and Truths that continue throughout each dispensation. New Rules that govern the new dispensation that were not given in previous dispensations. Rules that changed or modified in the new dispensation. New Stewardship Institution is responsible to carry out the new dispensation's rules. This position of the stewards are responsible to organize, manage, and execute the prescribed orders of the plan of God. The institution of stewards are ordained by God and change or are modified from one dispensation to the next. Failure of humanity’s obedience caused by failure of the stewards and the depravity of the heart of humanity. God’s long-suffering come to an end. Transition into the new or next dispensation. Starting at a particular event in the dispensation, resulting from the failure and permeation of sins and disobedience. The transition ends after the punitive judgment with the new dispensation taking full authority. Some of the residue is seen or mentioned in Scripture from the previous dispensation; however, it does not carry the authority it once did, and eventually it is no longer seen in the new dispensation. Irreversible Punitive Judgment that comes from God that was and will be performed by different decisive ways in His plan, they are not reversible judgments, but performed completely. The Definition of the Greek word translated dispensation or administration in the Word of God. The household rules that govern a house are within the definition of a dispensation. It is the management of the house. Dispensations are not controlled by time, but the failure of the economy caused by the permeation of the depravity of humanity. Today the word that describes dispensation best is administration. The meaning includes one who carries out the prescribed functioning given by an entity of authority. Also, for the existence of a dispensation three aspects has to exist. 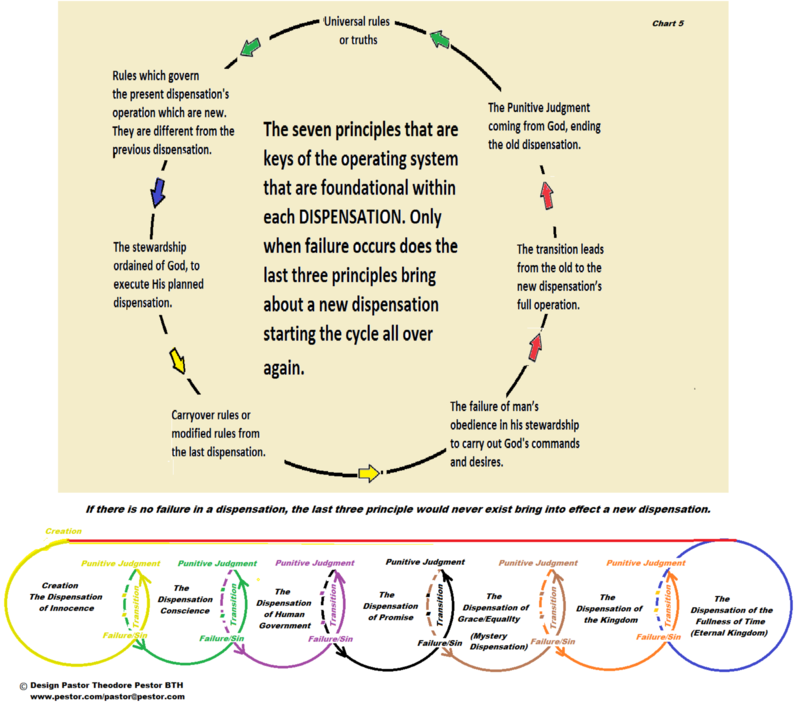 (Do not mix up the seven key principles of operation with these three). 3. The responsible stewards who are for leadership in carrying out the rules. God owns the world of humanity, (household). He reveals holy, just, and righteous rules for the operation of His creation. God ordains a stewardship institution to carry out His plan for creation. There is a chain of command, ordained by God for bringing about His Plan. Example to help understand the word dispensation is the working of an administration. 1st there is an authority that establishes the existence of an administrating. 2nd are the rules that govern an administration. 3rd are leaders or stewards which are responsible for the leadership in fulfilling the accomplishment of the operation. The layperson or worker is responsible for obedience as they live and work under the administration. If the administration fails, a new administration is instituted. 4th first comes the failure. 5th the failure brings about a transition from the old dispensation to the new one. 6th the old stewards or leaders are replaced with a new leadership and the workers who disobeyed were fired. 7th the new administration has rules that are universal, there are some rules that stay the same, others may be modified, rules carried over from the previous administration, and there will be new rules unique to the new administration not before given.